This recipe first appeared in the May 2013 newsletter – if you’d like more healthy food and living tips in your mailbox once a month, add your address to the free sign up. 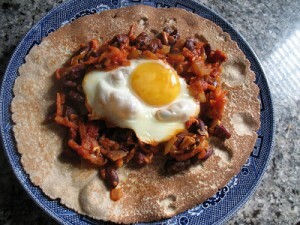 And if you’ve read the newsletter already, don’t miss the additional ideas for this bean dish at the end of the recipe. As the weather cools, I start craving beans. I’ve been making versions of this dish for almost 30 years. My latest chili bean recipe includes loads of antioxidant rich spices, like ginger and turmeric. If you don’t have them, the beans will still taste good without them. If using dried beans, soak your beans the day before in a large bowl, amply covered with water. The next day you will need to set aside an hour or so to cook the beans. Discard the soaking water and cook with fresh. Drain in a colander when done and set aside. In a large heavy bottomed pot, sauté onions in vegetable oil over a low heat. Take your time. You don’t need to hurry. Add your ground spices and chili. Keep cooking ‘til onions are transparent. Add garlic, chili, ginger and turmeric, and continue stirring. Pour in the cooked kidney beans, stir ‘til coated with onion and spices then add the two cans of tomatoes. Stir a little more. Add the carrot and parsnip. If you would like your beans to have a faintly smoky flavour, sprinkle in the paprika (or use Mexican chipotles instead of regular chilies). Stir once more and set the pot on a low heat. A diffuser mat is indispensable is useful for long, slow stovetop cooking. Cook for about an hour, longer if you have the time. Stir from time to time. Keep an eye on the amount of liquid. If it looks like it is starting to dry out add a little water or good quality vegetable stock. Before serving add a handful of fresh coriander if available. Serve with brown rice and a green salad. Leftovers: for a quick lunch reheat a single serve of the beans in a small fry pan. Make a well in the mixture and add an egg. Allow to poach slowly. Serve with crusty bread or on a toritlla. Don’t like chili? Skip it and add olives instead for a tasty but not not, bean dish. Can’t eat nightshades? Replace the tomatoes with 2-3 cups of good quality vegetable stock. Delete the chili and paprika. Add your favourite type of olives (large green or black work well). For a non-vegan variation, add some canned tuna 5 minutes before serving or top with a poached egg. With the added protein you can skip the rice.